Assalam o Alaikum, My Name is Abbas Malik. Today I will tell you about another new job that has been announced by Pakistan International Airlines. Excellent jobs have been announced by Pakistan International Airlines a vacancy for the position of CFO Chief Financial Officer. I will provide you complete information about this job and tell me how to apply. You must have at least 20 years of experience to apply for this job. Pakistan International Airlines, the national airline of Pakistan. PIACL is an equal opportunity employer. Female candidates are encouraged to apply. 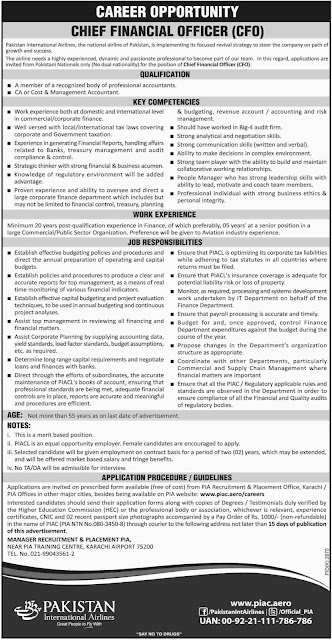 How To Apply for PIA Jobs 2019?